If you’re in Nashville, you’ve probably heard of house concerts, and been to at least a few. For those of you who don’t reside in Music City, hosting or attending a house concert is the perfect way to enjoy professional, high quality indie musicians playing their own original music. 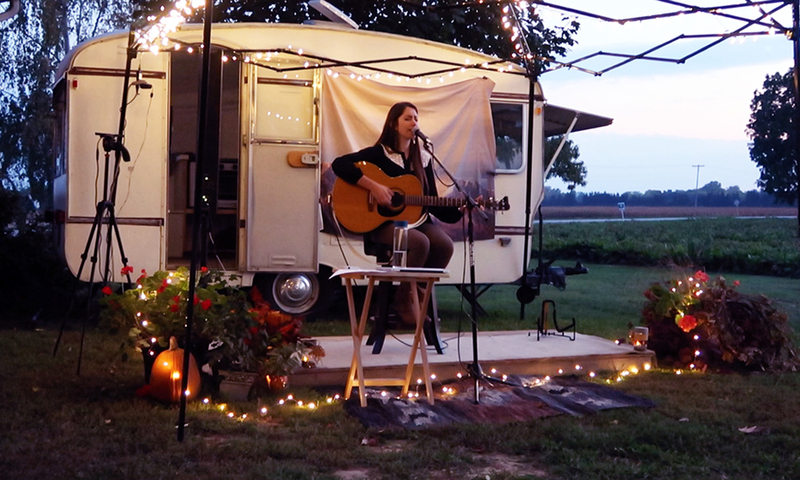 For steps 1-5 of How to Hold Your Own House Concert, read Part 1 HERE. 6. Keep track of your RSVPs. You can use a notepad or spreadsheet for keeping track of which potential guests say they will come. But guess what? About 10 or 20 percent of the people who say they will come – won’t show up. Don’t let it bother you. If you’re afraid of accepting more RSVPs than you have room for, start a waiting list. Promise to contact those people when you have an opening due to a cancellation. What time will they arrive? Give them a reasonable range of a few hours if they’re traveling a long distance. Do you have each other’s cell phones in case of last minute problems? Are you both promoting the same date and time? Mistakes happen! Do you have enough guests attending the show? If you’re having trouble getting RSVPs, be sure and let the artist know. You can work together to come up with ideas to make the event more appealing, or you can offer the artist the opportunity to look for other openings in the area.If you don’t think you have enough guests, please DO NOT just cancel the show. At this point, it’s probably too late for the artist to change their travel plans or take a different route. Many times, having a house concert with a low turnout is better than nothing at all. But be sure the artist knows in advance to expect this. What should I provide? Some hosts love to have a pot-luck dinner before the show, especially here in the South. Many of your guests will ask if they can bring something. A pot-luck dinner is a great time for the guests to get to know the artist before the show. If you’re not into pot-luck dinners, though, you can have a wonderful event with just tea and cookies. The artist will appreciate a few bottles of water. Some hosts like to provide alcohol, others do not. If you provide alcohol, DO NOT sell it. Selling alcohol without the proper licensing is against the law. If some of your guests offer to bring it, just do what feels right for you in your home. Prepare the room or space where the artist will be spending the night and preparing for the performance. Every musician gives their best performance if they have a secluded place to relax and warm up for at least an hour before the show. In this space, provide a few bottles of water and a light snack to hold them over until the pot-luck dinner. Prepare the space where the food will be. Set up the area for snacks and beverages, or the pot-luck. Make it easy for the guests to serve themselves. Set up the living room for the performance. Make sure there’s a spot about 4’ x 6’ for the artist to perform, more if it’s a duo or a band. Remove the coffee table and other extraneous pieces of furniture, and push the sofas against the wall. Then, leaving an aisle, arrange the shortest chairs in the front, taller ones in the middle, and barstools in the back. Aim some light toward the performer, and have the rest of the room a little darker. Protect your property. You’ll be acquainted with most of your guests, but it’s still a good idea to take a few precautions. Valuables and breakables should be put away, and anything that looks like a safety hazard needs to be fixed. Make sure all your exterior lights are working, get the toys off the sidewalk and driveway, and check around, indoors and out, for anything else that could be a problem. Set up a merchandise table. Make sure the artist has a high visibility table for their CDs, other merchandise, and tip jar. 10. Stay in control: Turn the crowd into an audience. As the host, it’s your responsibility to educate your audience and manage their expectations. This is especially important if this is your first event, because you’ll be setting the standard for all your future house concerts. You would have started doing this with your first email, by emphasizing that it is a CONCERT. Don’t let anyone get the impression that it’s a party with music. Reinforce the message that this is a concert in every conversation and email leading up to the event, so each invited guest will be able to make it clear to the friends/spouse they bring with them. Make the message part of the show’s introduction and intermission, and you’ll have a respectful and attentive audience. Keeping the message that it is a concert will help the artist perform better, too. Even the most experienced performer loses their spark when they have to work to get the crowd’s attention. If the crowd is acting like they’re at a party instead of a concert, the artist won’t be able to concentrate on playing music and being entertaining. They will instead be spotting problems and trying to come up with solutions as they perform. When the crowd isn’t quiet and respectful of the performer, nobody wins. Your audience won’t get the inspiring experience they could have had, and the artist won’t sell as many CDs. Some in your audience won’t come back for your next house concert, and the artist will tell their friends not to perform at your future house concerts. Yes, word gets around in the music world. Some house concerts will turn into festive events, because of the nature of the performer. If so, the expectation should still be that it is a concert. Let the concert’s festive nature be a surprise! Remember High School Algebra class? Where everyone wanted to sit on the back row? You don’t want that to happen at your house concert. As people start to arrive, ask a few to take the front row seats and set the example for others. Five minutes before the show is the time to ask everybody to take their seat. Tell them that the concert will be in two sets, and that in 40-45 minutes, they’ll have the opportunity to get up again. Be sure and tell them to silence their phones. If you don’t, someone’s phone will definitely ring during the quietest song in the set. Introduce the artist. A brief introduction is all that’s necessary, unless you just enjoy being verbose. Say something like “Hey everyone, thank you so much for joining us at our house concert. Tonight we’re thrilled to bring you, all the way from Nashville, Tennessee, Music Maker!” [ Use their real name. 🙂 ] Then start applauding, and your audience will applaud with you. When you stop, they’ll stop, so applaud the length of time you would like to give the artist. Some hosts like to delegate the role of announcer to a friend who would be good at it and enjoy it. Give them a scripted sheet ahead of time. Choose someone who has a strong, clear voice with an authoritative and friendly delivery. If you have any stragglers who haven’t settled in yet, don’t make your introduction until they’re all quiet. Just stand there and smile. You’ll make them uncomfortable, and they will quiet down quickly. During the break, encourage your guests to purchase CDs and other merchandise. Direct them to the merchandise table. You can help this process along by unwrapping CDs for the musician to sign. Have a Sharpie nearby for that purpose. Encourage your guests to sign up for the artist’s mailing list as well. Get the second set started after 15-20 minutes. Just dim the lights and make the announcement to get people back in their seats. After the show, spot the people who may have had too much alcohol (if you had alcohol at your event). When your friends tell you they had a wonderful time, be sure and respond positively. “Thank you, I’m glad you enjoyed it!” might be an appropriate response. Encourage them to sign your guest list if they weren’t invited directly from your emails. Then follow up with a thank you email to all your guests. You’ve just had your first house concert! Wasn’t it fun? Your next one will be even more fun, because you’ve already got your large potential guest list, and you have the experience of a successful event. Do you still have questions about hosting a series of house concerts? Watch for our upcoming article, “House Concert FAQs”. We would love to hear your comments below!